Limited Editions: one of 77 prints for each design size, check out pull down options above. Art Prints are individually printed, energized, hand singed and numbered by artist Elena Khomoutova. Artist provides the signed Certificate of Authenticity, embossed with her special Seal. The Limited Edition Art Prints are museum quality collectable prints. Description: Have you been in Vancouver? 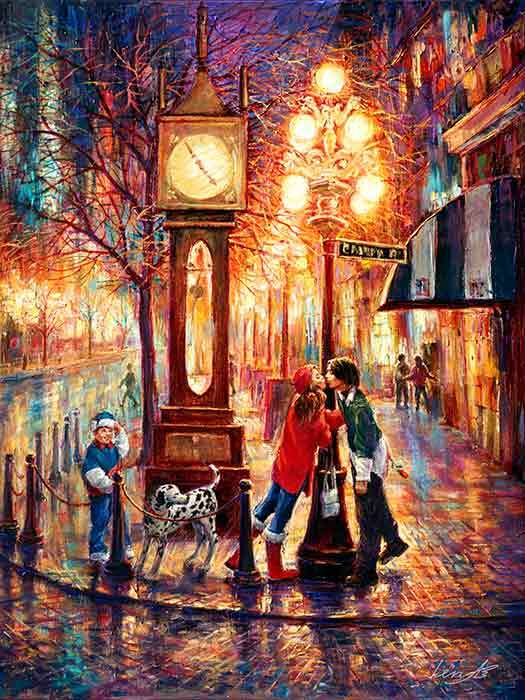 There are famous Power Steam Clock in Gas Town on the art print. Did you find 7 similar elements and a hidden owl on the art print? The owl is a symbol of wisdom. Seven similar elements are for your good luck. You are right - 7 open water lilies are for good luck on this art print. Did you find the owl? Elena uses ancient Feng Shui energy principles in her art and her own life. This print is great for your baby boy and girl nursery decoration. The print is the awesome for your baby boy and girl nursery decoration, or gift for Housewarmings, Weddings, Engagements, Valentine's Day, Birthdays, Holiday, Christmas, Graduation, any romantic occasion or a magnificent and exciting treat for yourself. It brings pure positive energy and excitement to your home.